As far as blades go in your survival gear there are three basic functions covered by a variety of tools. The first, is to puncture, slice, and cut, the second is to saw, and now we’ll cover the third in a brief outline of the best choices for survival chopping. When you have to drop a tree with your survival axe for some serious firewood you need the right tool. What Makes Up An Axe? There are two different parts of the axe that you need to be able to recognize in order for you to be able to select a quality ax that will last you a life time. The head is the part that bites into the wood. The best ax heads are made out of one piece of forged steel, securely fastened to the handle. Some axes such as those made by the Estwing® ax company, are made out of one piece of metal with a comfortable rubber grip attached over the metal handle. There are a variety of different axes for different jobs. Here are some of the most common types. Hatchet, camp ax, tomahawk whatever you wish to call it, has the same basic makeup. It has a 1 to 1 ½ pound head on a 10 to 14 inch handle. It is great for limbing, and it is also the perfect size for splitting kindling for a fire. It can easily be carried to the campsite or stowed in your Bug Out Bag for making emergency shelters. The forest, boys, or range ax as it’s often called, is the jack of all trades of axes. 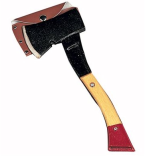 With a head weighing between 2 and 2 ¾ pounds, and a handle between 18 and 26 inches in length, it is the perfect mix between the convenient size of the hatchet, and the weight of the felling axe. It has a thinner blade than most, weighing about 3 to 4 pounds. Its light weight and thin shape allow for it to be hefted sideways and cut quickly into the side of a trees grain. Some models have a double blade in the fashion of a medieval battle ax. In my opinion you really don’t need two blades whizzing by your head as you chop. The maul is heavy in comparison to its chopping brothers. With a head weighing from 5 to 12 pounds, it is designed to concentrate force downward onto the piece of wood you are trying to split. The blade is fat and rounded to help keep it from sticking into a stubborn log. Using a maul you will split logs much faster than any other ax. 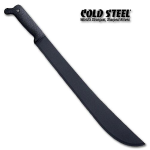 I do not have the space here to list the endless capabilities of the survival machete so I will explain in brief. A machete isn’t an ax at all, it’s more of a long knife used for light chopping and slashing your way through brush. They are used all over the world by native people for building shelters, killing game, and for many other tasks. Their blades range in length from 12 to 26 inches in length, and have handles made from a variety of materials including wood, plastic, and simply just layers of cloth or string. Gerber makes an excellent basic machete that is priced right. I would recommend at least a forest ax and perhaps a splitting maul for use around the house, more so if you have a wood stove or fireplace to fuel. Also, when you buy an ax, it doesn’t come sharp. A mill file and a good sharpening stone should take care of maintaining the edge on all of your outdoor tools. Please use common sense when working with any and all cutting tools. Tell us what kind of chopping blades you use the most?